This interesting surname recorded in some thirty spellings including: Josce, Joisce, Joss, Josse, Joass, Joce, Jose, Joyce, and possibly others is English and French. It derives rather surprisingly from the Breton personal name "Lodoc", itself a diminutive of "Iudh" meaning "lord". Lodoc was the name of an early Breton prince. He was also it is claimed, the brother of St. Iudicael, whose fame helped to spread the name through France and after the Norman Conquest, in England as well although by this time the spelling was Josse. The name was occasionally borne also by women in the middle Ages, but it was predominantly a male name, by contrast with the present usage. The personal name is recorded as Joasce and Locius (circa 1140 - 1150) in the documents known as the "Social and Economic History of the Danelaw". 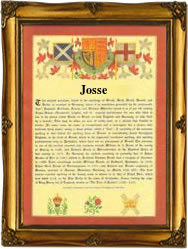 The surname dates back to the early 13th Century, (see below), but was clearly introduced into Britain at least twice as the register of the French Huguenot Church, Threadneedle Street, London, shows that Paul Jose was christened there on November 27th 1610, and Nomey Josse on September 6th 1612. The first recorded spelling of the family name is believed to be that of Alexander Joce, the sheriff of London in 1273. He is recorded in the register known as the "Chronicles of the Mayors and Sheriffs of London". This was in the first year of the reign of the famous King Edward 1st of England. He was known with good reason as "The Hammer of the Scots", 1272 - 1307. Throughout the centuries, surnames in every country have continued to "develop", often leading to astonishing variants of the original spelling.